Our centre is set in a peaceful valley in a strategic location near to seaside, mountains and hilltop towns. The house has been recently restored and boasts large, comfortable rooms. 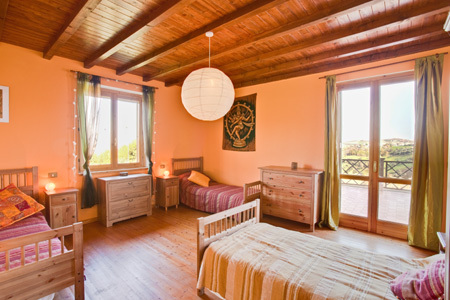 The bedrooms are bright, spacious and beautifully decorated. Guests also have the use of a kitchenette and sitting room complete with board games and books. The standard course price is based on shared accommodation but there are a couple of single room available, please enquire. One room can also be used as a triple. Bathrooms are shared. All towels, bedding etc provided. We have two main spaces for yoga - the beautiful terrace overlooking the Conicella valley and a stunning yoga room for those days when it is too hot to do yoga outside. We own about 2 acres of land - ample space for wandering around and relaxing - with plenty of areas for both sun and shade seekers! It also gives us plenty of room to grow our own fruit and vegetables which add an extra freshness and flavour to the home cooked vegetarian meals that we know you'll love. In 2010 we added a swimming pool, sauna and wooden decking terrace and in 2015 added a brand new hot tub.